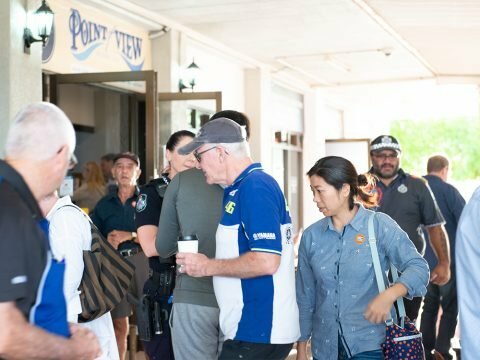 The event was kindly hosted at the iconic ‘Point of View Restaurant & Café’, with many locals turning out for a free coffee and also important road safety information, including how to stay safe on our roads during the Easter Holiday period. Superintendent Virginia Nelson said it was great to see the turn out to this event and by the amount of people that attended there is no doubt Wellington Point locals are passionate about their community. “This sort of engagement over a coffee is fantastic,” Superintendent Nelson said. This event is part of a series of engagements focused on the Queensland Police Service’s Easter Road Safety Campaign under the Operation Wake Up banner. Thanks to Redland City Councillor Wendy Boglary for her efforts in making CWAC eventuate, to our Volunteers in Police, Police Liaison Officer Tommy Govenor and Crime Stoppers for attending with very relevant information. A special thanks to Eric, Norm and Gayle from Writers Reserve for sponsoring the event.